Take Massachusetts Turnpike (I-90) to Albany. Pick up I-787 north to Cohoes. Connect with Route 7 west to I-87 north. Follow I-87 (Northway) to Exit 30, then use directions: "From New York and New Jersey". Drive time from Boston: 5 hours. Take I-90 (NY State Thruway) east to Exit 36 (Syracuse). Pick up I-81 north and follow to Watertown. Take Route 3 and follow it east to Saranac Lake, then follow Route 86 east to Lake Placid. Drive times: from Buffalo - 5 and 1/2 hours, from Rochester - 4 and 1/2 hours, from Syracuse - 3 and 1/2 hours. Take Route 15 south to Champlain Crossing, connecting with I-87 south. 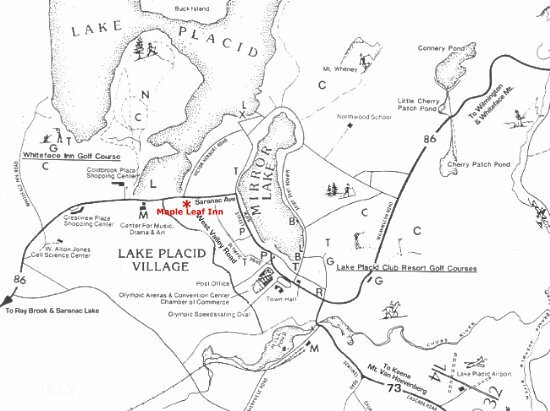 Take Exit 34 west, following Route 9N, then follow Route 86 to Lake Placid. Drive time: 2 hours.